Quickly becoming a hotbed for combat sports, the Crowne Plaza Hotel will host another mixed martial arts card when Orthrus Promotions’ “Triple A MMA VIII: Rivals” event takes place on Saturday July 26th in Albuquerque, New Mexico. 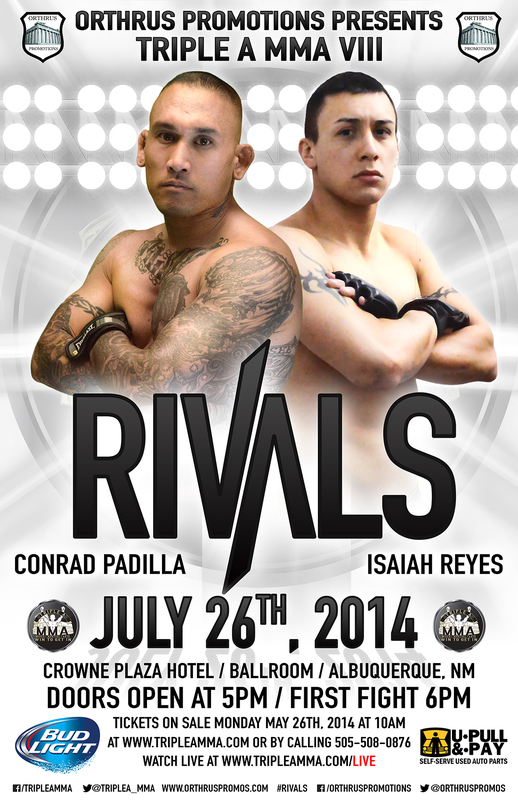 The main event features Jackson’s MMA Conrad Padilla (5-1) against FIT/NHB’s Isaiah Reyes (7-4). Both men look to get bounce back into the winning column when they square off. Padilla, lost for the first time in his career last August against Nick Rhoads at Jackson’s MMA Series 11. Reyes, comes into the contest having lost a close contest to Jeff Fletcher at King of the Cage – Boiling Point last September. Eleven additional fights are planned to take place on the card and will be streamed live at www.TripleAMMA.com. Stay tuned to SWFight.com for the complete card. Tickets, which start at just $25.00, go on sale Monday May 26th 2014 10am/MST at www.TripleAMMA.com or by calling 505-508-0876.